A man walked along a Toronto street repeatedly firing a pistol into restaurants and cafes, shooting 15 people and killing two before dying after an exchange of gunfire with police. The unidentified man started his shooting rampage late on Sunday in the neighbourhood known as Greektown. Toronto Police Chief Mark Saunders told reporters a 10-year-old girl and an 18-year-old woman were killed. “We are looking at all possible motives… We do not know why this has happened yet,” he said. A girl aged 8 or 9 was also in critical condition, said Saunders. Toronto police spokeswoman Meaghan Gray said the victims included eight women and girls, and seven men. Dr Najma Ahmed of St Michael’s hospital said five patients in serious or critical condition were being treated. She said three of the five underwent immediate lifesaving operations. The condition of the other victims at other hospitals was not immediately known. “This is an attack against innocent families and our entire city,” Toronto Mayor John Tory said in a city council meeting on Monday. The gunman, a 29-year-old Toronto man, exchanged fire with police, fled, and was later found dead. The suspect, who was not identified, had a gunshot wound but authorities would not elaborate on the circumstances or cause of his death. Reports of gunfire began at 10pm (02:00 GMT Monday), CityNews.com reported. A video from one witness showed a man dressed in black clothes and a black hat walking quickly and firing shots from the sidewalk. Andrew Mantzios told The Globe and Mail newspaper he was having coffee with friends when shots rang out. He said he saw a man with a “horrible expression on his face” shooting at a crowd of people waiting to cross the street. John Tulloch said he and his brother had just gotten out of their car when he heard about 20-30 shots ring out. “We just ran. We saw people starting to run so we just ran,” he said. Tanya Wilson was closing her tattoo shop on the street when a mother and son ran into her store with gunshot wounds to their legs. 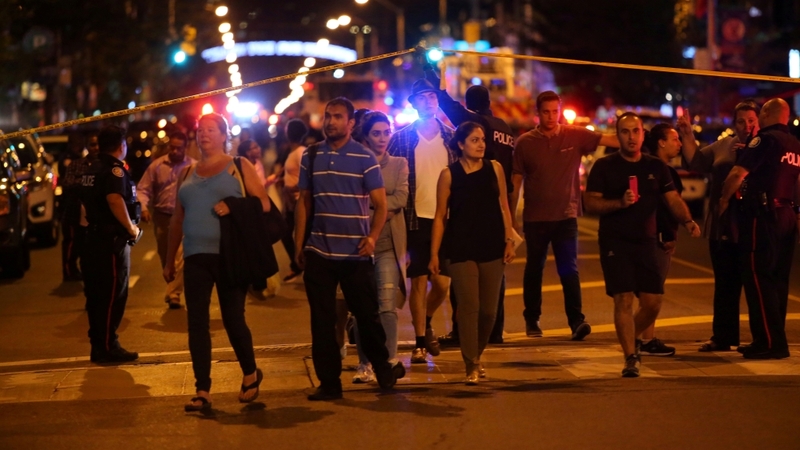 Paramedics, firefighters, and police converged on the scene of the shooting in Toronto’s east end, which has many popular restaurants, cafes and shops. Toronto is grappling with a sharp rise in gun violence this year. Deaths from gun violence in the city jumped 53 percent to 26 so far in 2018 from the same period last year, police data showed, with the number of shootings rising 13 percent. 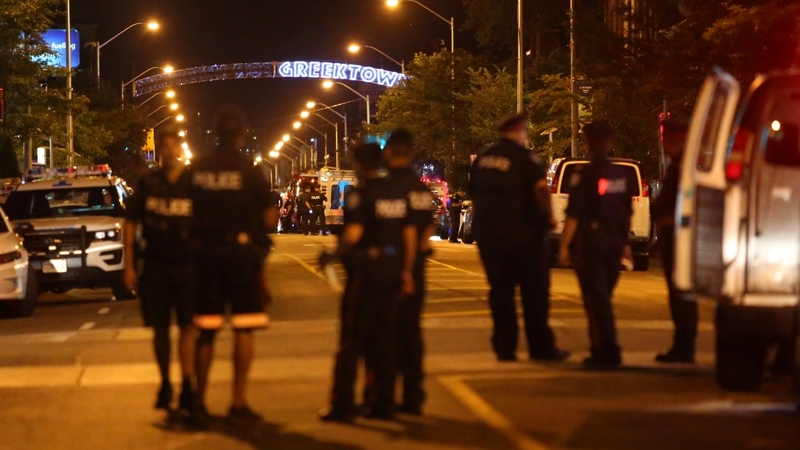 Toronto deployed about 200 police officers on July 20 in response to the recent spate of shootings, which city officials have blamed on gang violence. Toronto Councilor Paula Fletcher said Sunday’s attack was “not gang related”. Mayor Tory vowed to pursue gun-law reform after the mass shooting.